An original cel set up from The Jungle Book. Iconic! 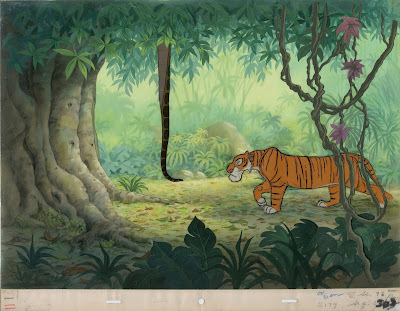 Beautiful background art and Milt Kahl's cutting-edge animation. A German journalist told me years ago that part of the reason why he adores this film is the fact that you, as the audience, are spending time in the lush Indian Jungle for the duration of the movie. What could be more soothing on the eyes? I had never thought about it in that way, I just love this movie.